Looking for a low impact but effective workout? Elliptical machines may be the way to go. With elliptical machines you can get a great cardiovascular workout with reduced impact or pounding on your joints when compared to running. Research suggests that total calories burned after an hour long workout in the elliptical can be similar to calories burned from running on a treadmill, depending on the intensity of the workout of course. More and more people are finding elliptical trainers to be an effective way of burning calories while reducing the chances of injury. ProForm emphasizes on building smart fitness equipment by paying attention to the details. This produces the lasting durable exercise equipment users want. They focus on building elliptical trainers that reduce impact and joint stress. Their SixStar Certification reaffirms users that ProForm ellipticals are some of the more ergonomic, smooth exercise machines out there. The ProForm 150i elliptical impresses on many levels. For starters, this elliptical was designed with bio-mechanics research input for the frame, hence the SixStar certification. Users will come to realize rather quickly how natural and fluid the motions are on this elliptical. The workout options are pretty impressive to; users can access up to 12 levels of power incline with 5 percent increments. You can target different muscle groups and up the intensity levels of your workout. It’s great for beginners because it lets you begin at any fitness level so you can stay in a comfort zone before working up. There are up to 10 different workouts (like muscle toner, THR Zone, intervals weight loss, Custom plans) providing variety in your workout regimen. Focus on fat burning, endurance tests or a customized workout program. The ProForm 150i elliptical comes equipped with advanced tracking features, more specifically the profile performance tracking technology. This lets you track workout results like calories burned, time, distance, heart rate and watts. The Polar receiver for wireless heart rate monitoring is another impressive feature when you decide to go hands free. The flywheel weight comes at a solid 23lbs, stride length at 20 inches, non-slip premium pedal cushioning – good features and measurable for balance and smoothness. The console on this elliptical is 16-digit alphanumeric display, 2 LED feedback windows and an LED progress window. There are some nice entertainment features like iPod / MP3 input, letting you zone out and forget you’re exercising. Users also get built-in speakers, which is nice. The ProForm 150i boasts a solid warranty package, 5 years frame warranty, 90 days for parts and 90 days for labor. 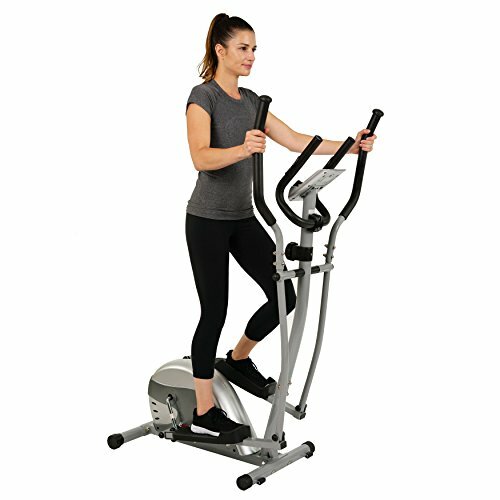 Those interested in buying an elliptical will find a lot of merits with this elliptical machine, it sells for around $1000 which is competitive and affordable, it’s designed with specific emphasis on natural body movements which translates to reduced joint stress and injury – always a plus among elliptical users. This elliptical has the right number of workout plans and preset programs to meet just about any user, whether novice or expert. There isn’t that added option of adjustable stride length which is fixed at 20 inches, a feature that’s nice to have but not necessary in my opinion. Plus the grander, more expensive elliptical machines usually have the adjustable stride option making for an added $600-$1000 (on average). There isn’t a lock pin to keep children from tampering. A sturdy but not too flashy elliptical with a max weight threshold at 250 lbs., there is no doubt the ProForm 150i will be a consumer favorite. Schwinn continues to make waves in the fitness industry. Their focus on three Cs – comfort, control and convenience has connected with consumers, along with their budget friendly multi- faceted elliptical trainers. Horizon offers an assortment of in-home fitness equipment including elliptical machines. The Schwinn 470 latest addition in the competitive market of elliptical trainers. With so many elliptical machines out there with established brand names and strong followings – this elliptical has a solid blend of competitive pricing, smoothness and variety. You’ll notice the Schwinn 470, along with many Schwinn products (elliptical, treadmills etc.) boast a SixStar Certification. This is the science and technology behind the natural feel and comfort users experience on this elliptical. Stemming from biomechanics research, the Schwinn 470 model delivers an ergonomic workout keeping them honest with one of their main pillars – comfort. As for control, this elliptical has a heavy-duty flywheel at 14.3 lbs. enhancing fluidity and smoothness in the elliptical stride and motion. Braking system / resistance that’s magnetic which also contributes to the quietness of the elliptical ride. It features a longer stride length for wider range of motion. With the Schwinn 470 model users get 25 electronic resistance levels for more workout variety – along with a manual five position incline increasing your range and intensity levels for your workouts along with varying options. For those who like to set goals, challenge themselves and generally push further, the Schwinn 470 has a really interesting feature called the advanced GoalCenter. This helps users track their progress daily. Couple this with on the fly changes including ten programming options and its easy to see there’s more than enough options to keep you challenged and adequately track your progress on your way to achieving fitness goals. The console is 6.7-inch LCD display with green back lighting. Compared to the display of its competitors, it comes up short. It feels a little cluttered and really leaves room for improvement. The stride length is another issue – it comes at 20 inches but is fixed, for most elliptical users that’s fine but smaller or taller users prefer an adjustable stride length so that’s something to consider. There’s no lock pin with the Schwinn 470, if you’re concerned about safety and tampering – this mostly concerns for those with children. This elliptical does allow for rear access and reduced pedal heights (low-10 inch SURE step step-on height) for easy mount and dismount making for easy accessibility. There are some nice amenities – Pulse grip feature allowing you to track pulse rate as you workout by simply gripping the handles, Sonic surround sound speakers along with MP3 features so you can work out to your own special tunes, and a fan to cool you down. As for the warranty plan, the frame comes with a 10 years warranty; the brakes parts and labor all come with two-year warranties. Schwinn gives you the option for extended warranty plans, one and two years. A solid all around exercise machine, this elliptical is very affordable and offers solid options to keep you in shape and meet your exercise goals. It’s no surprise Exerpeutic Gold elliptical machines and fitness equipment has enjoyed Best Buy ratings from leading consumer magazines four years in a row. Despite not having the brand recognition other elliptical machines have like Precor or Sole Fitness, Exerpeutic Gold has successfully managed to stay relevant in the competitive world of elliptical machines. Exerpeutic Gold elliptical machines have a reputation for offering the most complete and challenging workout experience – a workhorse in the industry. If you’re constantly looking to intensify your workout, this is probably your elliptical. If you’re a beginner there’s no need to be overwhelmed. Given the wide range of options, the Exerpeutic Gold is also a perfect starter elliptical for newbie’s. There are enough features and programs to cater to those who want to ease into their workout and those who seek a more challenging, demanding workout session. Users can track results on a green LCD display. This includes total exercise time, incline, intensity, speed, calories burned, pulse rate and total distance traveled. This elliptical provides 15 workout programs, twenty resistance levels and a quick start option, giving users enough options to explore and keep their workouts exciting. There are four added cross-training programs and two custom programs. And if that’s not enough, the workout provisions include a Trainer’s program package consisting of random cross, manual, interval, and hill climb and sprinting. The Exerpeutic Gold elliptical comes equipped with a heart rate interactive program consisting with five options: target, interval, hill, cardio and fat burner. One of its special features is a warm up and cool down function. This added feature is getting more appealing to users. It’s been shown to minimize injuries and ease your workout experience. When this elliptical is engaged, the fluidity and smoothness really stands out. This can be attributed to the incline motor, electromagnetic brakes comprising of fluid resistance and patented linkage design. An added benefit is a workout with lower impact on joints and reduced overall stress on hips, knees and back. To monitor your heart rate, this elliptical provides a hand held pulse sensor on the machines stationary handle bars, the alternate option is a built in compatible heart rate receiver that works together with a chest strap. Both options are displayed on the LCD monitor. The Exerpeutic Gold provides a good warranty package and fine customer support. It’s a lifetime warranty for the machines frame, a one-year warranty on mechanical and electronic parts, one-year labor warranty and 90-day warranty on wear items. You won’t find added amenities or extras like a built-in fan, bottle holder, speakers or MP3 outlets on this elliptical – but you do get a book holder. Users would also find the stride length is not adjustable coming fixed at 19 inches. Some people appreciate an adjustable stride length especially for the price this elliptical is commanding, so that could be an issue. Still make no mistake; Exerpeutic Gold owners get optimum features, ideal comfort and industry leading performance with this elliptical. Whatever might be deemed as a demerit or setback, the Exerpeutic Gold more than makes up in the area of usability, variety and total workout experience. 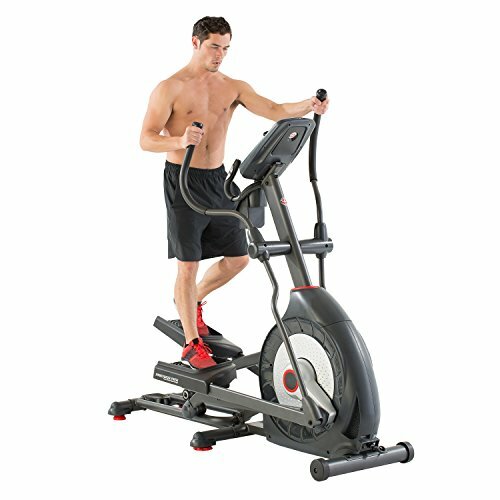 Ever since EFITMENT Fitness released its ground breaking patented elliptical trainer in 1998, the first of its kind with a unique fold-up feature, the company has been garnering rave reviews among customers and respect in the industry. The model E6200 won the coveted “Best Buy” by consumers digest and ever since, EFITMENT Fitness ellipticals have not missed a step; continuing to earn praise among customers. In 1999, EFITMENT Fitness cemented its reputation as one of the top fitness equipment manufacturers in the world. They always seem to be at the forefront with cutting edge technology. This has served them well in the very competitive market of elliptical trainers. 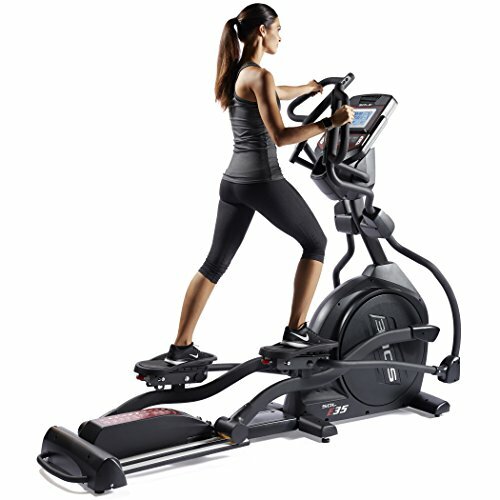 The EFITMENT Fitness E005 Deluxe elliptical does not disappoint; as versatile as any elliptical trainer in the market. This machine offers arguably the best workout experience out there bar-none. The E005 features EFITMENT Fitness’ patented PerfectStride technology. This offers users ideal stride motion, ergonomically correct foot positioning, and stride length adjustments and an optimal incline. A feature that’s particularly important because it significantly reduces joint stress that could lead to injuries. Unlike most ellipticals, the E005 has no lower wheel track reducing the wear and tear caused by added friction resulting in little or no maintenance whatsoever and is very quiet. The E005 comes with multi-position handgrips to provide a better fit for users along with adding variety to your workout by letting users target different muscle groups. EFITMENT fitness prides itself on designing user-friendly consoles. The E005 has unobstructed rear access along with low step-up height with side handle bars making it easier for users of all body types to mount and dismount the elliptical. You get a console with an extra large display, blue back lighting making it easy to track distance, incline pace, heart rate, time, calories burned and other features. To monitor your heart rate, this elliptical offers built-in contact grips and a telemetric receiver. All you have to do is hold the sensors on the handlebars and your heart rate is displayed on the screen. If you need a more convenient heart rate monitor, you have the option of a wireless heart rate device so you don’t have to grip the sensors. This feature is sold separately. With the E005 you will not be wanting for variety in your workout. This elliptical gives you a challenging exercise experience, with nine pre-programmed exercises and 20 different resistance levels. The ramp incline provides 20 ranges / levels with adjustments ranging from 18 and 37 degrees making sure you don’t get bored with your workouts. There is an exclusive Sprint 8 Perfect Fitness solution workout option. This program is clinically proven to reduce body fat, boost energy and promoting lean muscle. The stride length ranges from 20 inches to 21.5 inches, which is a good range due to varying user height. But more importantly this elliptical allows you to adjust the stride length which makes a world of difference for users. Adjustable stride ellipticals appeal to the various user sizes and body types allowing each user the ability to tailor their workout for maximum efficiency and that sense of security. If you are buying for more than one user, this is one feature that should not be overlooked. Without an adjustable stride length some users may feel like their strides are shuddering or unbalanced, others may feel like they have to overextend their limbs on each stride. 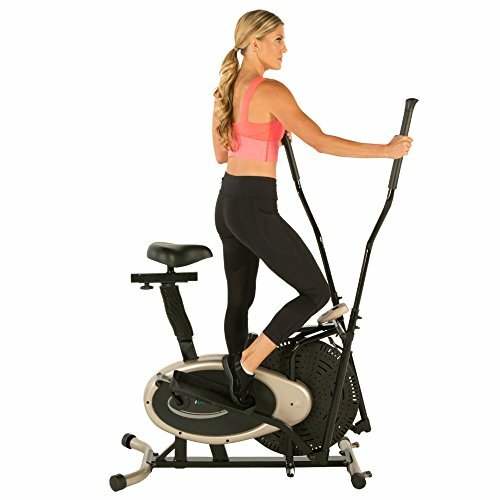 You will find a good number of ellipticals out there do not offer this feature, like the Sole E35 Elliptical, one of the E005 competitors. They tend to be lower in price but also functionality and overall user experience. With all the features that come standard with EFITMENT Fitness E005 deluxe, there are some things it lacks. You won’t have the luxury of a user account, bottle racks for water, or a locking pin if you have children and are concerned about their tampering with the Elliptical. There’s also no MP3 or iPod outlet, but it does have a book stand where you could place your books – or any other gadget you desire. You get a solid warranty package – a lifetime warranty for the frame, 5 years for mechanical and electronic parts and a one-year labor warranty, but concerning wear products or items there is no coverage. There are numerous ellipticals out there promising various things, but rarely do you find a machine with a great workout variety, ease-of-use, cutting edge technology and full control on workouts including machine functionality (adjustable strides, multi-position hand grips). This Elliptical easily meets all your fitness needs and more. Sole Fitness is captivating the fitness industry with great ideas and unique designs. Their machines combine top of the line components to provide a smooth, seamless workout for users. Sole Fitness business approach of cutting out the middle man and dealing with the customers directly is also a breath of fresh air as some customers would appreciate the savings derived from being able to buy directly from the manufacturer, as well as discuss service and warranty concerns. With Sole ellipticals expect great exercise equipment from a company that continues to raise the bar in the fitness industry. 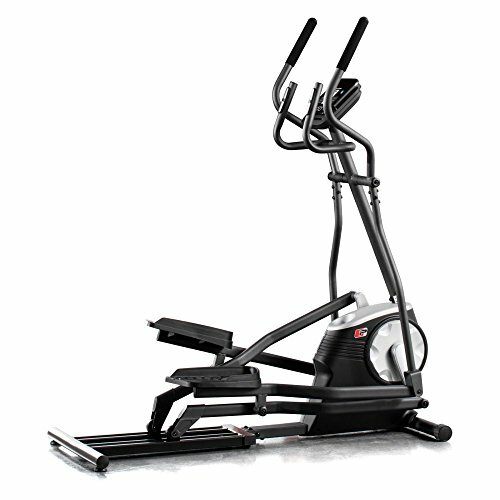 Sole Fitness E35 Elliptical Machine delivers again, they cover a lot of basis with this upgrade on the previous model. Users will love the additional six new workout positions allowing them to target more muscle groups efficiently. Sole also upped the Electronic Adjustable Incline on this elliptical to 50% incline, with this powerful trainer users also get a wireless heart rate monitor, stationary wrap around handle bars, and grip pulse handle bars. The ramp angle is 0 to 30 degrees, which is great for lower muscle groups. People who have bought a Sole elliptical in the past with not be disappointed with this machine, Sole customers tend to be loyal and are typically looking for the best elliptical trainer for their money as opposed to the cheapest. The Sole Fitness E35 Elliptical Machine rear drive, electromagnetic braking system is one of the most coveted in the industry. Amongst other specifications Sole lists the Counter Rotational Core Motion and a maximum user weigh of 375lbs. This is a large but comfortable elliptical with Sole’s SureFit Soft Pivoting Foot Pedals, iPod docking and charging areas and water bottle holder also provides great workout options with 12 pre-set programs and 9 custom programs. Lets not forget the appealing 7.5-inch LCD. People who are committed to exercising, and want a good solid elliptical that is expected to last and function like new for years are likely Sole buyers. This elliptical has features you would expect to find in machines that sell above the $3000 range, but prices are just around $1,349.99 on some online outlets including Sole’s website. People looking to buy an elliptical machine will also appreciate Sole’s 30-day trial period, which shows they back their product. Offering a 30-day no questions asked trial period is the icing on the cake for this superb elliptical but in my opinion it should be standard in this price range. Dimensions are 27 by 58 by 83 inches (W x H x D) so this is truly a big machine and the only negative is it may not be the best for smaller workout spaces but should fit most people’s needs, including the big and tall and there are not many ellipticals for big and tall users.